Free Printable March 2018 Blank Calendar. 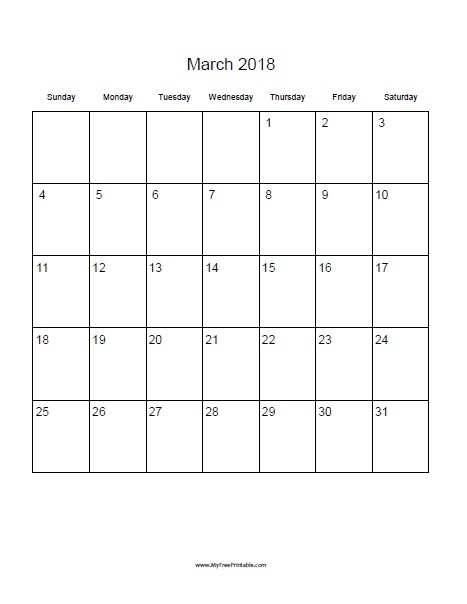 A simple and blank calendar that you can easily print and use at home, school or work. Our calendars are available in portrait or landscape orientation and starting the week on Sunday or Monday. Write notes, messages, holidays like St. Patrick’s Day, important days like the first day of spring and the start of Daylight Saving Time. Use any 8 ½ x 11 inch sheet of paper to print your calendar and keep close to you at the kitchen or workplace. Click the link of your choice to save or print the calendar now.